I think this journalist from the Indy Star just needs to take a couple deep breaths and lighten up. For a little background, one of the time saving tips that Rachael Ray gives is to place a large plastic bowl on your countertop so that you can easily toss scraps, wrappers, and cans in it without having to make trips to the trash can. She calls said bowl a garbage bowl and it sells on Amazon for about 15 bucks. Now, Rachael uses a vintage melamine bowl for her garbage bowl. Hers are fun and spunky looking and they can get pretty pricey on E-Bay. 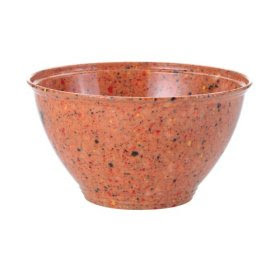 Because she got so many requests asking where to get the bowls she uses (I got a fair share of emails asking me the same question), Rachael launched her own line of melamine Garbage Bowls that have the same fun look as the vintage ones she uses on TV, but for less cash. Now, I hate to put myself in the role of Garbage Bowl Defender, but I can't help myself. First, the beauty of the garbage bowl is that it is large (much larger than the journalist's suggested cool whip or sour cream containers). Second, the garbage bowl sits on the counter, right next to where you are preparing the food. So, it saves time because you don't have to fuss with a bag hanging from a hook, or pushing down the trash in the can, or dragging your trash can around the kitchen and having items fall from it onto the floor as you are cooking. It all just sits nice and neat on your counter and with one dump, it's in the trash. Plus, if we have to explain to you why it's fun to have a cute/special bowl for your garbage bowl, then you wouldn't understand the answer. And I have this question for the journalist that wrote this piece - isn't it amazing that we live in a world where journalists have the luxury of writing an entire article about a plastic bowl? I have to agree with you... it is an amazing world we live in when a journalist can get paid for writing an entire article about a garbage bowl! I love the suggestion of using one to save time... but, what I have been doing lately is just pulling the garbage closer to my work area so, I throw stuff in as I go. What a lame article. I can already find 2 things wrong with it: a) who cooks and only has enough scraps to fill a Cool Whip container? and b)paper bags are useless if what you're throwing away has liquid or is wet. Lady needs to stick to articles on stuff she knows about. Obviously, she has no idea about marketing. Anyone smart would realize, "Hm. People like my garbage bowl idea. I think I'll sell it." I had never heard of using a garbage bowl until I started watching RR just a few months ago. I just grabbed one of my plastic bowls that were around the size that she uses and I found it to be awesome. It is so handy to have all the garbage tossed into one spot instead of on my counter or having to walk over to my garbage container. There was a suggestion to just put your garbage container over where you are working, well who wants to walk around that when you are trying to cook supper. Rachael has taught me more in the last few months than I have learned in all my years on this planet. I never ever thought I would be making awesome meals like I do now. Is that really the best issue she could think of to write about? I can see the Pulitzer now . . . geez. Talk about harping on a non-issue. If you don't want an $18 garbage bowl, don't use it! I agree with everything you guys said! I mean, if you think it's stupid, don't buy one. What's the big deal? I use a bowl I got on clearance 30 years ago but I call mine the compost bowl as 99% of it is compostable or recyclable. Jan - that's a very good idea!